THOSE trying to fly to or from Chicago in the past week learned first-hand the shortcomings of America’s public infrastructure. A suicidal employee set fire to a nearby air-traffic-control centre, resulting in the cancellation of thousands of flights, the third such interruption this year. The chaos is aggravated by a system dating from the 1950s that relies on radar. Unpredictable funding has delayed its planned replacement with a system that uses satellites. Public infrastructure is one of the few forms of government spending that both liberals and conservatives support. Ports, power lines and schools are essential to the smooth running of the economy. But as America’s outdated air-traffic-control system shows, public investment is at the mercy of the fiscal weather. Cash-strapped governments are loth to pile on debt or raise taxes even for something as popular as a new road. After a burst of stimulus spending in the immediate wake of the recession, public investment has fallen back in the rich world (see charts). This is profoundly short-sighted. That is the message of a new study by the International Monetary Fund, released as part of its half-yearly “World Economic Outlook”. It found that in rich countries at least, infrastructure spending can significantly boost growth through higher demand in the short run and through higher supply in the long run. This comes with caveats: the results depend on how the investment is financed, how efficiently it is carried out and what the prevailing economic conditions are. As it happens, the present conditions are perfect. Upfront fixed costs for infrastructure projects are typically high and operating costs relatively low. For these reasons, public infrastructure is often a natural monopoly: a city needs only one local telephone network, electricity grid or sewer system, so they are frequently publicly owned or regulated. They are also expensive and politically sensitive and can thus be hard for private firms to finance. Evaluating the effect of public investment on growth is muddied by the question of causality: does infrastructure spending boost growth or do faster-growing countries spend more on infrastructure? The IMF answered this question by studying public investment “shocks” in 17 rich countries between 1985 and 2013, when investment grew more than forecast, on the theory that politicians are unlikely to have boosted spending at the last minute because the economy was doing well. The results were striking. On average, an unexpected increase in public investment equal to 1% of GDP boosted GDP by an underwhelming but still beneficial 0.4% in the same year and by a more impressive 1.5% four years later. The extra spending did not result in unsustainable debts; quite the opposite. Thanks to higher GDP, the debt-to-GDP ratio fell by 0.9 percentage points in the first year and four percentage points after four years, although the authors do not set any store by the latter figure because there was so much variation in the results. Importantly, however, those averages cloak significant differences. When investment is financed without borrowing—that is, with higher taxes or cuts to other spending—it has a small but still positive impact, which grows over time. The authors interpret this as evidence that even when public investment does not directly lift demand, it does so indirectly by “crowding in” private investment, for example by stimulating the construction of houses and factories when new roads and water mains are installed. Private investment, the authors note, rises in line with the new, elevated level of GDP after a burst of public investment. Judging by these results, the time is now optimal for more public investment. The added demand would be welcome since unemployment is still too high in most rich countries and interest rates near zero. 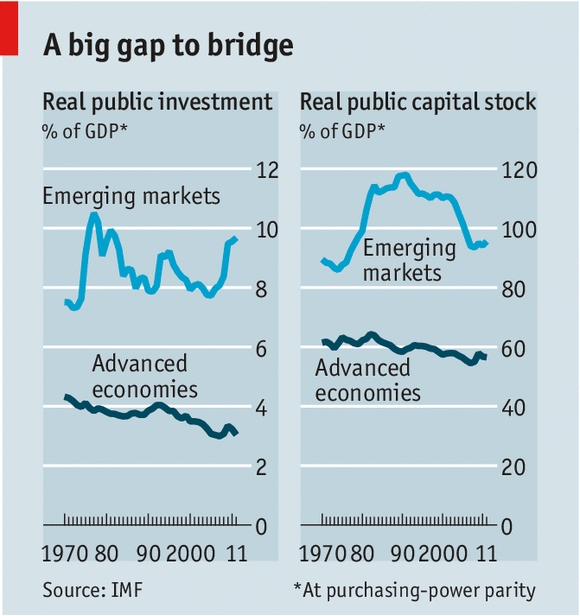 The supply-side effects may also be considerable; declining public investment has led to a shrinking stock of infrastructure relative to GDP (see charts). Investment and the capital stock are higher relative to GDP in emerging countries, but they are much lower per person, and thus also ripe for a boost. Still, identifying a general shortfall in infrastructure investment is easier than working out what projects to spend extra money on. Of the seven biggest rich economies, only Germany and America have suffered a clear deterioration in infrastructure investment since 2006. And public investment is easily wasted on vanity projects such as football stadiums or inflated contracts with politically connected suppliers. Even in relatively transparent, democratic places such as America, with lots of bureaucrats to conduct cost-benefit analyses, identifying the most beneficial investments is hard. The interstate highway system, built mostly during the 1950s and 1960s, delivered huge productivity benefits, according to a 1999 study by John Fernald of the Federal Reserve Bank of San Francisco; returns to expanding the system would presumably not be as big. Moreover, in America, it takes between nine and 19 years to plan and build a big highway. By that point, the optimal moment for boosting public investment may have come and gone several times. The original article is linked here.